An evening Wasted or not? We have a couple of reviews of the musical Wasted. London Theatre gives it 3 stars, although some of the remarks wouldn't be there is the reviewer had known a little more about the Brontës. A new show that has twenty-seven musical numbers in it is, in one sense, quite impressive, given the overall tendency to have performances brief enough to dispense with an interval. The satirical musical revue Forbidden Broadway praised Mamma Mia! when it first landed on Broadway, for being the new musical that’s so good it has two acts. But included in the ‘tracklist’ for Wasted are ‘Infinite Eternity’ in the first half, and ‘Infinite Eternity (Reprise)’ in the second, which is what made me think of that anecdote from the late Nineties. This isn’t exactly a tortuous show, but it’s far from perfect. A four-piece on-stage band performs very well, and with no set (there are some props and costumes) the scene changes are pretty slick. The musicians sing as well as play instruments – while actor-musicianship is fairly commonplace, the musician as an actor is less so: here, the band acts as a sort of chorus at times. Beatboxing and animal noises (don’t ask) are voiced convincingly by drummer Nathan Gregory. I ought to say something about the show’s title, perhaps not quite the elephant in the room, but the source of some discussion: why call a show about the Brontë siblings Wasted? The show (spoiler alert) seems to suggest it is in the minds of the siblings that they had not, at any given point in their lives, achieved what they set out to achieve, thus their dreams, hopes and desires were ‘wasted’, along with the efforts made between them in writing the likes of Jane Eyre and Wuthering Heights. It is rather severe, but such thoughts could plausibly have preoccupied them at the time. The sound balance is good, as are the lighting effects, and the noise levels perhaps a little too quiet for something billed as a rock musical (or perhaps Bat Out of Hell The Musical and Six are too loud? ), but nonetheless comfortable. Charlotte (Natasha Barnes) outlives her siblings, and thus gets a couple of songs to herself towards the end of the evening’s proceedings. Emily (Siobhan Athwal) gets more emotional than the rest, Anne (Molly Lynch) came across to me as the most agreeable one, while Branwell (Matthew Jacobs Morgan) continued with his hopes and aspirations long after his ‘I wish’ number, called ‘I Am Gonna Be…’. The Brontës are, to quote the title of the opening number, ‘Stuck in Haworth’. No, sorry, I cannot agree: Yorkshire people love Yorkshire. Unfortunately, the production didn’t quite regain a good standing with me by the curtain call, but not because of further holes in the plotline. Rather, the sheer repetitiveness of some of the musical numbers meant the show dragged far more than it ought to have done. In the title number, for instance, the word ‘wasted’ was used at least twenty-two times – a very conservative estimate given I only started doing a tally part-way through the song. Whatever for? Certain verses are rapped, but painfully slowly. I suspect the siblings’ father, the Reverend Patrick Brontë, could probably have recited church liturgy at a faster pace. There is, just about, sufficient variation in terms of style within the musical numbers, though it is telling that the most intriguing and poignant moments were two sections of spoken word towards the end of the show. The narrative just doesn’t fit the recklessness associated with rock and roll – at one point, someone wants to go off and be a governess, and there isn’t a scintilla of even considering going against their father’s instructions regarding a trip to Bridlington. Hardly unrestrained abandon. The Reviews Hub gives it 4 stars out of 5. If the gentle sounds of Chopin would fit well with the novels of Jane Austen, what would suit the Brontés [sic]? Iron Maiden? The proposition is carried forward in this new musical, telling the story the Bronté siblings and setting it to a pulsating rock score which reflects the harshness of life in Victorian Yorkshire, struggles against poverty and disease and an unforgiving moorland backdrop. 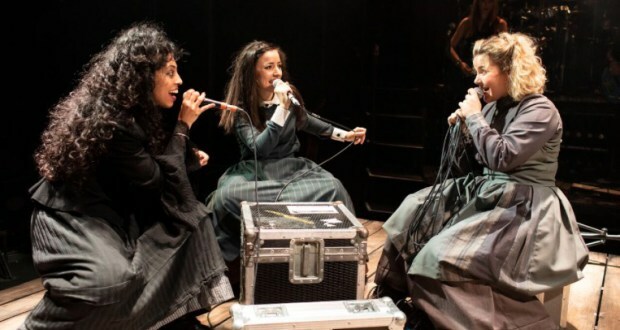 There is already an established link between the Brontés and the rock world and Siobhan Athwal’s appearance playing Emily, with wild dark hair and eccentric movements, makes a reference to it that seems unlikely to be coincidental. 40 Years ago, when Kate Bush was recording Wuthering Heights, a show like this might have been developed as a concept album and, now in 2018, we could have been seeing a concert performance of that album. Perhaps director Adam Lenson had this thought in mind for his staging, the four performers, dressed in drab period costumes, all using hand-held microphones on a wooden platform with the audience on three sides of them and a four-piece band on the fourth. Natasha Barnes gives a powerhouse performance as the gritty Charlotte, last survivor of the siblings and narrator of the story. “F*** off, I’m writing Jane Eyre” she yells at Anne, signalling her determination to succeed as a writer. Yet even she is forced to marry a lowly curate, the very thing that she would not allow the heroine of her most famous novel to do. Athwal’s Emily is a brooding, tormented genius who insists “no one must know that Emily Bronté writes anything”. Molly Lynch’s Anne is quieter and more sensible, fretting over the impossibility of finding a husband and thereby escaping the family’s parsonage home in the town of Hawarth [sic]. Their father, curate Patrick Bronté is not seen in the show. There is comedy and pathos in Matthew Jacobs Morgan’s portrayal of Branwell, the only brother. A failure as an artist, unable to hold down a job, a drunkard and a womaniser, he has sad delusions of grandeur, likening himself to Napoleon. “Branwell Bronté had sisters; who would have known?” he proclaims, seeming to recognise the irony in the words as soon as he speaks them. Carl Miller’s book and lyrics are more concerned with establishing and developing characters than with driving forward a strong central narrative and each song becomes the heart of an episode in the story. Christopher Ash’s throbbing hard and soft rock score demands a second hearing (bring on that concept album) and, even if some of the singing is uneven, Joe Bunker’s band does full justice to the music, with himself on keyboards, Kat Bax on bass, Nathan Gregory on drums and Isabel Torres on guitars. More on stage, as La Vanguardia (Spain) shares the highlights of the theatre season in Navarra. Vox asks five writers about how they go around dressing a character. The Independent has an article on how period dramas are not 'utterly incapable of artistry'. Blogger News Network interviews writer Marty Ambrose. Papel en blanco (in Spanish) posts about The Tenant of Wildfell Hall. Coincidentally, Rachel Sutcliffe discusses abuse in that novel.